According to the latest data from NACE (the Worldwide Corrosion Authority), the global cost of corrosion is estimated at $2.5 trillion. In the US alone, the cost is nearly $500 billion, most of those costs incurred in the industry sector. However, 15-35% of the corrosion costs could be saved by the implementation of corrosion control practices, and a corrosion management system. Steel corrosion protection coatings are a vital part of a corrosion protection system. Steel corrosion protection coatings act as a barrier between the metal and its environment, increasing its durability and lifespan. To determine the right anti corrosion coating for steel in your project, it is important to factor in the environment and type of metal. Whether corrosion is due to moisture, chemicals, salt spray, or oxidation, corrosion resistant coating for steel and metals can help protect the substrate from the elements. To determine the right type of steel corrosion protection coatings for your project, you need to understand the environment and use of the substrate. Particularly its exposure to water, moisture, and other aggressive substances that might be present in the environment. The corrosivity of certain atmospheres has been classified and standardized by the International Organization for Standardization. The standard divides the degree of corrosivity into 5 categories , C1 to C5, in order of increasing corrosivity. To find the right anti corrosion coating for steel, you need to know how corrosive the environment will be. For example, a coating at C5M level is intended for offshore constructions which are constantly exposed to moisture, but also for small pipes that are equally exposed. 1 – very low corrosion risk: Heated buildings with clean air, interiors only. Suitable for: offices, schools, hotels, shops and other heated premises. C2 – low corrosion risk: Unheated buildings, rural areas. Suitable for: storage facilities, sports halls, garages, barns and other unheated buildings. C3 – moderate corrosion risk: Buildings with high humidity, urban and industrial areas. Suitable for: laundries, breweries, kitchens, food processing sites and other buildings with moderate humidity. C4 – high corrosion risk: Chemical manufacturers and swimming baths, industrial and coastal areas. Suitable for: industrial buildings, chemical plants, swimming pools, ports, and ship- and boatyards. C5 – very high corrosion risk: Buildings with almost permanent condensation, offshore and industrial areas. Suitable for: Water pipes and other industrial applications (C5I – industrial). Offshore and maritime constructions (C5M – marine). 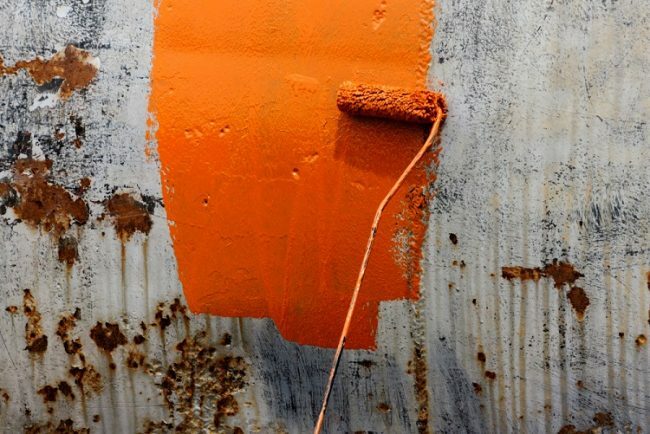 Once you have identified your environment, you can identify the right coating systems for your project and the right anti corrosion coating specification to protect it for years to come. 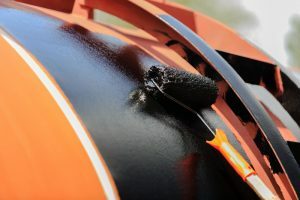 Following these guidelines will allow you to pick appropriate steel corrosion protection coatings, allowing you to avoid overspending on unnecessary degrees of protection or simply making the wrong choice. Anti corrosion coating for steel can be applied as any other coating as long as it is a barrier or inhibitor coating. Barrier coatings (C1 – C3) – non-porous coatings designed to prevent corrosive factors coming into contact with the substrate. For example: powder coating, polyurethane paint, chloro rubber paints, Teflon coatings, nano coatings. Inhibitor coatings (C1 – C4) – release a chemical which interferes with the electrolyte and stops the corrosion process. For example: all oil based coatings with corrosion inhibitor additives such as zinc, aluminum, zinc oxide and so on. Galvanic coatings/Cathodic protection (C3 – C5) – metal-rich coatings which provide a sacrificial layer. Prevents corrosion by providing a more easily corroded metal (such as zinc) to be the anode to the protected metal’s cathode. Also called the sacrificial anode, this metal will corrode instead of the protected metal. Note that cathodic protection can be applied as pre-treatment and topped with a barrier or inhibitor coating. Hot Dipping is the process of immersing a metal in a bath of metal, often molten zinc, in order to form a coating. The liquid metal bonds to the substrate and forms an alloy, which is then coated in zinc as it is removed from the bath. Hot dip galvanizing uses the principle of cathodic protection, as the zinc coating acts as an anode to its substrate. Thermal (metal) spraying applies zinc or aluminum to a substrate by taking the metal in the form of a powder or wire and feeding it into a special spray gun. The metal is melted within the gun and can then be sprayed onto the substrate. It does not alloy, but instead works by coating the surface in overlapping metal platelets. When hot dip galvanization is used together with a topcoat of steel corrosion protection coatings (liquid or powder) it is known as a Duplex System. The system provides multiple types of protection and the longest-lasting results. Each layer needs to be compatible in order for the system to work effectively. Duplex systems are especially suitable for corrosion categories from C3 to C5. A duplex system includes five protective coatings to prevent corrosion which all complement each other and result in one of the best corrosion protection coatings for steel. Steel corrosion protection coatings are applied in layers. Surface preparation: derusting, blasting, removing grease, oil, dirt for optimum adherence. Hot dip galvanizing OR an inhibitor coating primer; metal coatings to prevent corrosion are used depending on the coating system of your choice. Applying a sealer: To seal the metal coating to prevent corrosion from getting too close. Often epoxy based. Intermediate coat: there may be several layers necessary for optimum protection, depending on the corrosion category. Finishing coat: provides appearance and surface resistance, often first line of defense. For smaller substrates or DIY application up to category C2, painting is also an option. There are also small anti corrosion spray paint cans available for this purpose. An anti corrosion spray can be described as an ultra thin fluid film compound which you can spray on any steel or metal surface. In spray form it can protect for up to a year. But keep in mind that more exposed areas that are getting constant abuse from rain and salt will need spraying regularly. In paint form, longer lasting results can be accomplished depending on the coating system you choose. 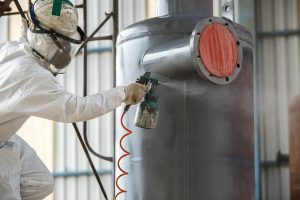 For the best result always opt for two component protective coatings for steel with corrosion inhibitor additives, for example a zinc rich epoxy coating. Here is a selection of products on the market to give you a rough guide as to the price of corrosion protection coatings for steel. Keep in mind that for categories C4 and C5 it is not recommended to apply the coating yourself. Please search out a specialist in that case. There are Federal branches that produce guidelines for specific applications, such as the Federal Highway Administration, US Department of Transport’s “Steel Bridge Design Handbook” which includes Corrosion Protection of Steel Bridges. Rely on a professional when applying anti corrosion coating for steel! If you are looking for a professional company to apply the steel corrosion protection coatings for you, it’s important to understand how prices are established before you request a quote. Different coating processes use different methods to calculate the cost of professional application. Hot dip galvanizing prices are usually calculated by weight. The galvanizer will quote a price per ton, and then use the weight of your steelwork after galvanizing to calculate the final cost. Unlike galvanizing, powder coating prices tend to be calculated by size or surface area. Regional differences in materials, labor, and equipment can all have an impact on overall costs when contracting a coating expert. If you want to receive a custom made quote for anti corrosion coating for steel, please contact us.